The Garden Helpline accepts calls daily during regular Extension Office hours. (Closed on State holidays.) Extension Master GardenerSM volunteers staff the Helpline during the growing season and answer hundreds of gardening questions. We are available for phone calls and walk-ins. After gardening season, your questions will be answered by Alison Arnold, Extension Agent, Consumer Horticulture. 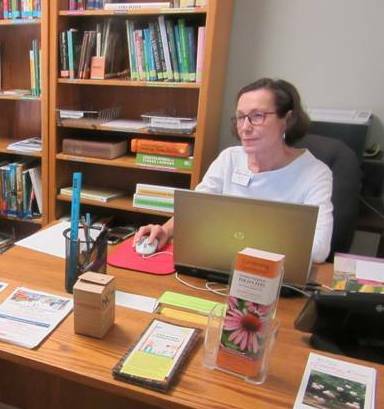 During the growing season, March through September, Extension Master GardenerSM volunteers are on duty to answer phones and assist visitors Mondays and Thursdays, 10:00 a.m. to 2:00 p.m. Call 828-255-5522 or bring your plant problem or question to Buncombe County Extension Center, 49 Mount Carmel Road. (Please bring samples large enough for plant identification). Click here for tips on collecting samples of plants and insects: Collecting Samples: Plants & Insects You may also click here to email us. Please contact us, we’re here to help! From October through February when the Helpline is not staffed by Master Gardeners, your questions will be answered by the Extension Agent. The Extension office hours are Monday through Friday, 8:00 – 5:00. The Extension office and our Helpline are closed on N.C. state holidays.